In May 2008, 3 Egyptian mummies on display at Manchester University Museum, in Britain, were covered with a white sheet in the name of respect. Without being requested to do so by the present day Egyptians, or the public; with whom the display is popular, professionals at the institution took it upon themselves to place a sheet over the unwrapped mummy of Asru, partially-wrapped Khary, and a child mummy. After protests from local audiences and the media, the museum uncovered the mummies but stated it wished to continue to conversation about how to respect the human remains. This sensitivity, by professionals, about the display of ancient bodies is not an isolated case. Over the last thirty years, human remains in museum collections have become the focus of various claims and campaigns. My monograph, Contesting Human Remains in Museum Collections: The Crisis of Cultural Authority, examines the social construction of the contestation over human remains in Britain with a weak social constructionist method. It explores the symbolic meanings and strategic use of human remains, and how the body becomes a locale for cultural, political, and ethical debates. The controversy over human remains in collections in Britain became prominent in the late 1990s. After high-profile campaigns, and despite fierce opposition, the Human Tissue Act 2004 was passed, amending the 1963 British Museum Act, and consequently permitted, and encouraged, the removal of human remains material from specific (and previously resistant) museums. Notably, the emergence of the issue in Britain is different to elsewhere in two important respects. Firstly, there was significantly weaker external pressure on institutions compared to Australasia, America and Canada, which responded to claims for repatriation from indigenous groups. A survey conducted for Human Remains Working Group characterised claims from overseas indigenous groups on institutions as ‘low’ (DCMS 2003b: 16) and found only 33 requests on English institutions, seven of which had already been agreed to, and some of which were repeat claims from the same group. Secondly, while elsewhere the focus of attention has been human remains associated with indigenous groups who suffered under colonisation, the problem has been extended by professionals in Britain who argue that all human remains require special attention. 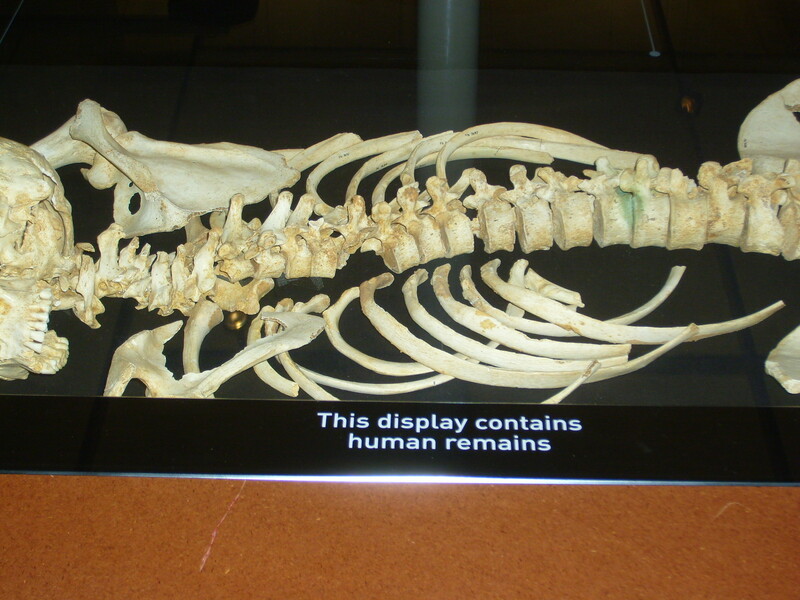 Whilst certain material is more difficult, now, to retain in museums due to historical associations – particularly Aboriginal remains – some professionals promote the claim that all human remains should be subject to new codes and attention and have removed human remains from display or changed how they are exhibited. Bristol City Museum & Art Gallery, for example, has changed their display of Egyptian human remains. 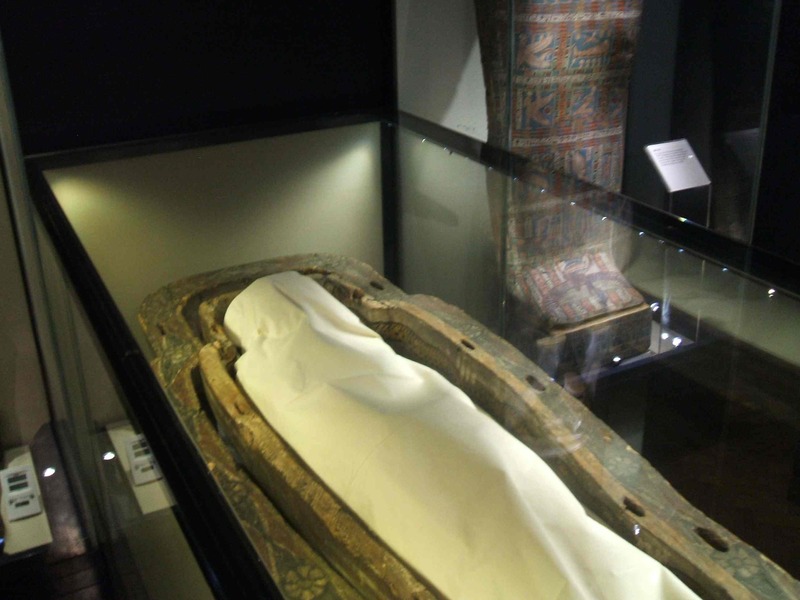 Instead of the previous display of mummies in open coffins, it now exhibits the mummies with the lids half closed, which it considers more respectful. See, also, papers from this conference on respecting all human remains, held at Manchester University Museum. Theorists have examined the museum as ‘sites of contestation’ as influenced by a number of social changes. The controversies over the representations of the past and different histories are predominantly understood as the results of tension due to the challenges from external forces; in particular social movements who make demands regarding the representation of their culture. Contestations over human remains and cultural property are often analysed as influenced by indigenous movements applying pressure on resistant professionals (see for instance, Phillips & Johnson, 2003; Greenfield, 2007). The institution is characterised as resistant to those challenges. These accounts have limitations when applied to the British context. In Britain, where the claims-making activity from overseas indigenous groups is comparatively weaker, it is not adequate to interpret high-profile contestation, which resulted in significant shifts in English law, sector and museum policy, as well as significant repatriations from major, and resistant, institutions including the British Museum and the Natural History Museum, primarily due to pressure from overseas groups. Furthermore, the analysis does not address why all human remains have become the focus for activism and cannot account for the extension of the problem to unclaimed human remains. My research suggests that the dynamic that warrants further theoretical attention, in the elevation of this issue, is an internal one. One the most important observations about the contestation over human remains is that it has been waged, less by social movements external to the institution as it is frequently characterised, but by insiders. Senior curators, directors and policy-makers within the sector, have been instrumental in raising various manifestations of the holding, display and treatment of human remains as a problem. My core argument is that the activities of the campaigning museum professionals, in promoting this issue, is a response to a crisis of cultural authority and an attempt to secure new legitimacy by distancing themselves from a discredited foundational remit. In what follows, I explore this argument, first by discussing the crisis of cultural authority. I then turn the main claims-makers, concluding with the problematizing of unclaimed human remains. Cultural authority involves the construction of reality through definitions of fact and value. Historical museums have held cultural authority, which frames and affirms the pursuit of truth and defines what is culturally significant. These institutions play a role in affirming ideas about the pursuit and organisation of knowledge, for reasons that are historically constituted. Whilst aspects of the museum can be traced back to the medieval Schatz, a treasury of goods collected by the Habsburg Monarchy, or private collecting in the Renaissance, it is the development of public collections in the eighteen and nineteenth century which, arguably, rationalised private collections into a specific meaningful public context. With the Enlightenment ideas developed about the absolute character of knowledge, discoverable by the methods of rationalism and its universal applicability, which informed the purpose of the museum and the rationale of the display of artefacts. In the last forty years, the traditional justification of museum institutions has undergone criticisms and scrutiny which have contributed to a crisis of cultural authority, as the foundational justifications were undermined. In addition to the constraints and pressures arising from the operations of the market, the central tenets of the Enlightenment, which informed the remit of the museum in the eighteenth and nineteenth century, have been called into question (Foster, 1985; Bauman, 1987). Whilst there was always hostility towards the principles of this period, a number of intellectual trends since the late 1960s have consolidated this critical outlook, challenging the truth claims and the idea of the museum as a distinct realm removed from social and political forces (Furedi, 2004). Postmodernism, cultural theory and postcolonial theory have variously interrogated the traditional justifications of the museum. With rise of postmodern and postcolonial theories culture and science came to be viewed, not as universal or objective, but as a damaging reflection of the prejudices of European cultures. The debates over objective truth and relativism, were rapidly assimilated into museology by theorists and practitioners. Until the 1980s whilst there was some examination of the social and educational role of museums it was marginal. This shifted dramatically later in the decade when a body of work developed criticising the idea that museums were value free, arguing that they are inherently political. Pierre Bourdieu’s work, Distinction: A Social Critique of the Judgement of Taste (1984) was a catalyst for this approach, in which he explores the social roots and organization of judgment and taste. Bourdieu developed the idea that cultural discernment was a marker of class position and that visiting galleries was a way to indicate taste and class. Cultural tastes were really influenced by primary and secondary socialisation processes rather than a response to universal values of truth or beauty. As a consequence of these intellectual shifts, the outlook of the earlier period which informed the role of museum: to validate the superiority of modern reason, to make judgments, to pursue the truth and to claim to pursue the truth, have been discredited. The development of museums in Western societies, it has come to be argued by a wide group of museologists and practitioners, occurred in specific historical circumstances and actively supports the dominant classes, maintaining the status quo as natural. Whilst there are significant variations in this approach, I venture that the challenges to the historical claims to objectivity and truth have been internalised and promoted by academics and professionals. Key issue entrepreneurs in framing the problem of indigenous human remains in museum collections were archaeological, anthropological and museum professionals, initially from North America and Australia. Individuals in Britain adopted the problem as a result of direct relationships between professionals, one method for the diffusion of ideas. This process is well-illustrated by following the emergence, and subsequent promotion, of the issue at the World Archaeological Congress, a non-governmental organisation. Anthropologist Peter Ucko was National Secretary and organised the first Congress in Southampton in 1986, previously he had been Principle of the Australian Institute of Aboriginal Studies in Canberra. It was here that the concern about the treatment of the human remains of indigenous groups developed as a problem, raised by indigenous activists and American and Australian anthropologists. Subsequently it became a “crucially important” (Ucko, 1987: 228) issue for the WAC. The Steering Committee “raised the problem” (Ucko, 1987: 231) amongst the museum community in Britain, arranging meetings for them with overseas claimant groups. Ucko and the anthropologist Jane Hubert assumed an ownership of the problem in Britain, acting as issue entrepreneurs. The promotion of ideas may be cultural as well as relational, which may help to explain diffusion that is rapid. While it is possible to chart direct relationships formed between campaigners, certain museum professionals were highly receptive to their campaign and adopted concepts quickly. In the early 1990s the Museums Association commissioned the museologist and activist, Moira Simpson, to undertake two research projects to determine its members’ views about repatriation. She found the vast majority of respondents accepted the notion. In one question, only 3 were categorically opposed, out of 123 respondents. Of these respondents, only 17 institutions out of 164 had received enquiries about repatriation (Simpson, 1997: 17). This suggests a hospitable reaction to the concept of repatriation that was not stimulated by specific requests. Similarly significant is the support from the Museums Journal – published by the Museums Association. Two editorials support repatriation in the 1990s, and include supporting articles and news report (Davies, 1993, 1994). The receptivity of certain members of the sector is further demonstrated by decisions taken by professionals to transfer human remains to overseas indigenous groups prior to the change in law. In the 1990s Bradford, Peterborough, University of Oxford, Pitt Rivers, Horniman Museum, Exeter and Witby museums, transferred human remains to Australia, Canada and New Zealand (DCMS, 2003a: 21; DCMS, 2003b: 29). Whilst these decisions were in response to requests from overseas groups, one was initiated by a Keeper of Ethnography (DCMS, 2003a: 28). Receptivity is also evident in policy that advocates the pro-active contacting of community groups (MEG, 1991; SM, 2001; B&H, 2006; Bolton, 2007; MUM, 2007; UCL, 2007). I am an archaeologist. My specialism is the Persian period..a big find has just happened and I should go, I am the expert of.. in this area, but I would much rather stay and do this, this is more pressing and important for me now. The personal identification with this problem speaks to its symbolic nature. Being involved in campaigning for, in this case, greater ‘respect’ for human remains generally, was counter-poised as more valuable than work involving his trained expertise. The questions of ownership of human remains has acted like a lightening rod for a wider, internal, debate over the purpose of the museum. Human remains became a vehicle to signal a repositioning of the museum away from its foundational role of research and authorative knowledge. It is this that helps to explain why we have since seen a continued problematisation of the display of human remains. An additional influence was the linking of the problem of human remains in museum collections with a major political controversy over the retention of children’s body parts, without what was considered proper consent, which took place in the late 1990s. In the early 2000s, museum professionals campaigning for the repatriation of overseas remains associated their cause with a number of different issues, including the Holocaust. But the event that had the greatest impact on the debate was the controversy over the retention of children’s body parts at Alder Hey hospital in Liverpool and other hospitals. Exploited by the UK government, the high-profile Bristol Royal Infirmary Inquiry (2000) and The Royal Liverpool Children’s Inquiry (2001) investigated the circumstances leading to the removal, retention and disposal of human tissue, including children’s organs, and led to legislation on the issue of consent. Campaigners suggested the two issues – retaining the remains of those who were long-since dead and the organs of recently deceased children – were equivalent. By linking these two issues, and others concerning human remains, campaigners tried to suggest that there was a general public outcry over the use of all body parts. With concerted activism linking the two issues, the idea that holding any kinds of human remains is problematic entered into policy and museum practice. Notably, this sensitivity is not shared by public opinion, despite the attempts by activists to suggest that it is. All surveys demonstrate that most people expect and want to see human remains on show in museums. Indeed they attract people into museums. An opinion poll of 1,000 people commissioned by English Heritage, found that around 90 per cent said they were comfortable with keeping prehistoric human remains in museums. The public want to see human remains on display. Although not as contentious as the display of Aboriginal or Native American remains, the public is generally positive about the display of ancient Egyptian remains, but we perhaps need to look at the future re-display of these remains. Seventeen museums have since drafted policies on human remains, with most advocating that signs are erected to warn visitors in advance. The Royal Cornwall Museum in Truro, does not show any images of human remains, other than wrapped mummies, in its online or publicity material. Bristol Museum, like a number of other museums, now places warning signs in front of the remains on display. The idea that all human remains should be treated differently has been internalised by sections of the museum professional without requests from claim-making groups. Sociologists examining the construction of problems identify and explore the claims-makers interests in promoting an issue. Joel Best (1990) observes that activists may stand to acquire more influence, or there may be indirect symbolic benefits which contribute to explaining their activities. In this case it is interesting that museum professionals have participated in activities that appear to subvert their status and query the role of the institution. These observations raise the question: why have professionals participated in campaigning activities that do not appear to be in their interests, which results in the loss of material of research value, and which disowns the foundational purpose of the institution? I venture that the sustained erosion of the traditional justification of the modern museum has stimulated an attempt by the profession to distance itself from this remit, and to create a new role for itself. Professionals involved in campaigning for changes to the way human remains are treated and for their repatriation, are involved in trying to create new legitimacy for the institution, by separating themselves from the foundational purpose of the museum. Bauman, Z. (1987) Legislators and Interpreters: On Modernity, Postmodernity, and Intellectuals. Oxford: Polity Press. Best, J. (1990) Threatened Children Rhetoric and Concern about Child-Victims. Chicago: Univ. Press. B&H. (2006) Policy for the Care and Treatment of Human Remains. Brighton and Hove Museums. Bolton. (2007) Human Remains Policy. Bolton, Bolton Museum and Archive Service. Bourdieu, P. (1984) Distinction: A Social Critique of the Judgement of Taste. London: Routledge & Kegan Paul. Davies, M. (1993) Editorial. Museums Journal, 94(4) London, Museums Association: 7. Davies, M. (1994) Editorial. Museums Journal, 93(3) London, Museums Association: 3. DCMS. (2003a) Report of the Working Group on Human Remains. London: Department of Culture Media and Sport. DCMS. (2003b) Scoping Survey of Historic Human Remains in English Museums undertaken on behalf of the Ministerial Working Group on Human Remains. London: Department of Culture Media and Sport. Duncan, C., Wallach, A. (1980) The Universal Survey Museum. Art History, 3(4): 448-469. Foster, H. (ed.) (1985) Postmodern Culture. London: Pluto Press. Furedi, F. (2004) Where Have All The Intellectuals Gone? Confronting 21st Century Philistinism. London: Continuum Publishing. Greenfield, J. (2007) The Return of Cultural Treasures. Cambridge: Univ. Press. HEM (2009) Human Remains Policy. Haselmere, Surrey. Haselmere Educational Museum. Kilmister, H. (2003) Visitor Perceptions of Ancient Egyptian Human Remains in Three United Kingdom Museums, Papers from the Institute of Archaeology,14: 57-69. LCMG (2006) The Curation, Care and Use of Human Remains in Leicester City Museums Service. Leicester: Leicester City Museums Service. Levitt, S., Hadland, L. (2006) Museums and Human Remains. Paper presented to: Respect for Ancient British Human Remains conference, 17 November 2006. Manchester University Museum. Accessed, 8 November 2010. McAdam, D., Rucht, D. (1993) The Cross-national Diffusion of Movement Ideas. Annals of the American Academy of Political and Social Science, 528: 56-74. MEG (1991) Museum Ethnographers Group Guidelines on Management of Human Remains. MEG. MoL. (2006) Human Remains Policy, London: Museum of London. MUM (2007) Policy on Human Remains. Manchester, University Museum. NMGW (2006) Collection Management Policies – Policy on Human Remains. Wales, National Museum and Galleries of Wales. Phillips, R.B., Johnson, E. (2003) ‘Negotiating New Relationships: Canadian Museums, First Nations, and Cultural Property’, in Torpey, J. (ed.) Politics and the Past: on repairing historical injustices. Lanham, Boulder, New York: Rowman & Littlefield Publishers: 149-167. RCM (2006) Policy on Human Remains, Truro: Royal Cornwall Museum. Simpson, M. (1997) Museums and Repatriation: An Account of Contested Items in Museum Collections in the UK, with Comparative Material from Other Countries. London, Museums Association. SM. (2001) Guidelines on Policy for Human Remains in Surrey Museums. Surrey Museum. Ucko, P. (1987) Academic Freedom and Apartheid: The Story of the World Archaeological Congress. London: Duckworth. UCL. (2007) UCL Policy on Human Remains. London. University College London. Vaswani, R. (2001) Remains of the Day. Museums Journal, 101(2): 34-35.